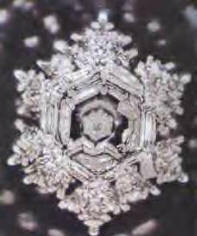 Only healthy water can form beautiful hexagonal snowflake-like crystals. Snow water, water in fruits and vegetables, cold water from deep wells and pristine streams - all have the ideal hexagonal structure. Tap water cannot form crystal hexagonal structures even when it freezes. Of all water’s properties, its hexagonal structure is probably the most important, but is also the most fragile. It is easily destroyed by environmental contaminants and modern water treatment processes. Water molecules are made of one oxygen atom and two hydrogen atoms (H2O). The relationship between these atoms gives water a unique electrical polarity. Water’s unique ability to form and transform; create and recreate; penetrate and dissolve anything it touches; and to collect and deposit information wherever it flows is what gives all living things their vital dynamism. Water molecules bond easily with other molecules. In other words, water is extremely “sociable”. It eagerly seeks to mingle with other elements and gladly picks up “hitchhikers”. This is a great feature if the water picks up good things like rich nutritious minerals and life-giving oxygen, but it’s a very bad thing when it picks up toxic pollutants, nasty chemicals or disease-causing organisms and then enters your bloodstream! 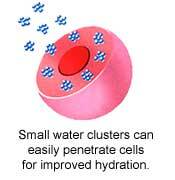 The smaller the molecular clusters, the easier water will penetrate your cells. One way to measure the size of the molecule clusters is using Nuclear Magnetic Resonance Technology (NMR). The lower the NMR reading, the smaller the clusters. Hexagon water has a certified NMR reading of only 42.3Hz*. Normal tap water, RO and distilled water have readings around 128Hz while bottled mineral water reads between 90 and 100Hz. *National Tsing Hua University Report No. GMC 0203001 dated 28th March 2002. All water contains a certain percentage of hexagonal units – some sources more than others. The percentage of hexagonal units appears to depend on a number of factors, including the energetic influences that water is exposed to. For example: chlorine, fluoride and many pollutants typically found in municipal water sources reduce the number of hexagonal units. Tap water typically has a very low percentage of hexagonal structures. On the other hand, there are a number of places throughout the world where the water has a high concentration of hexagonal structures. Many of these places are known as “healing springs.” (Many people have heard of Lourdes, France - a prime example) Others are known for producing inhabitants that live long and disease-free lives. Nuclear Magnet Resonance (NMR) is one of very few methods that can verify molecular size. NMR analysis shows that ordinary tap water is composed of large molecular units (between 12 and 20 individual H2O units). These unorganized molecular conglomerations are not nearly as supportive of biological functions as Hexagonal Water is now being shown to be. 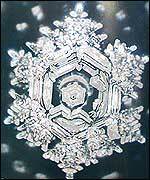 There is significant evidence that Hexagonal Water moves within biological organisms with greater ease. It appears to enhance nutrient absorption and the removal of metabolic wastes. (Many who consume Hexagonal Water report a cleansing reaction within days or weeks.) This may be due to the smaller size of the molecular unit and its ability to enter and exit the cellular environment with greater ease. It may also be due to the specific organization of the hexagonal network which appears to enhance cellular communication and to support other structures within biological organisms. We know that the total amount of water within the human body decreases as we age, but it is also being shown that the amount of Hexagonal Water decreases as well. In one significant study conducted in Japan, Magnetic Resonance Imaging was used to show that the amount of structured water in the body is directly correlated with age. (2) This same study presents evidence that biological molecules require structured water in order to perform their functions. According to the paper, when biological molecules are found in unstructured water, they are just compounds – they have a decreased ability to perform their intended functions. Snowflakes are formed as super-cooled water condenses around particulate matter in the atmosphere. Super-cooled water is nearly 100% hexagonally structured. (see below) It is able to maintain a liquid state, in the upper atmosphere – even at temperatures well below freezing. As this super-cooled Hexagonal Water freezes, it naturally assumes a shape which reflects the hexagonal unit from which it is made. Everyone has to constantly refill his or her body with water. Humans have lived 81 days without food but will die in 5 days without water. If a person loses 5% of his total water, he will start to hallucinate, become disoriented, and experience twitching muscles. If he loses 15% of his total water, his life is endangered. I know how annoying the advice to drink water may seem. Many of my younger patients, those in their teens and early twenties, become annoyed when I tell them to "drink lots of water." Why? Because throughout their entire lives, they have heard nothing good about water. Newspapers and magazines have been constantly telling them that their water is contaminated and dirty. This negative publicity also causes their teachers and parents to worry about the quality of drinking water. Simultaneously with this bad publicity about water, these people have been bombarded with glorious propaganda concerning soft drinks, coffee, tea, and beer. Ads imply that if you drink their product, you will be healthy and beautiful like the people in the photograph. Commercials make it seem like drinking the right beer will make you popular and happy. They almost always show a group of people having fun while drinking their brand of beer. The reality of a neighborhood bar is often quite different. Bars are full of lonely people. Laughter is few and far between. Even smiles are rare. If they stop to think about it, most people realize that soft drinks are harmful. But apart from realizing that sugar and caffeine are not good, they do not really understand why soft drinks are so bad for their health. The main difference between water and soda pop is that good drinking water has oxygen in it and soda has dissolved carbon dioxide gas under pressure, which forms the bubbles when you open the can or bottle. A person breathes in oxygen and exhales carbon dioxide. Carbon dioxide, like urine and feces, is one of the waste products of the human body. Drinking carbonated beverages adds large quantities of the very chemical the body is trying to get rid of. If you take carbon dioxide into your system, your body tissue will absorb it. There just isn't room for both the carbon dioxide and the amount of oxygen each cell needs. The carbon dioxide pushes some of the oxygen out of the cell. The result is that the cell which is exposed to carbon dioxide goes through temporary hypoxia-lack of oxygen-which induces faulty metabolism. This eventually results in diseased organs. Drinking soda keeps people from drinking water when they are thirsty. Soft drinks are harmful to your health because they do not cleanse your body's cells. Instead, chemicals in soda pop are accumulated within the cells as harmful waste products. When I tell my patients that drinking water will help them stay healthy, some of them ask incredulously, "Do you mean Cincinnati water?" Yes, I mean regular, Cincinnati tap water. Then my patients tell me how contaminated city tap water is, and that it causes cancer. If you go to any large city, most of the residents of that city will tell you that they have the dirtiest water in the U.S.A. Somehow, the media has convinced the majority of citizens that their water is too contaminated to drink. I don't understand why these people believe that adding coffee, tea or other chemicals to their tap water will make the tap water any safer. The mixtures of chemicals in drinks actually add contaminants to the water. Most people have all kinds of romantic pictures in their minds. They like to think that soft drinks are made from sparkling, splashing water which comes bubbling up from a pure spring somewhere far away in the mountains. They may imagine that there is a mystical fountain in a beautiful cave deep within Mother Earth where the bottlers go to make their delicious concoctions. Some brewers and bottlers might use spring water carted in from some other location, but it's not likely-if it raised the cost of production much, they wouldn't spend the money. The vast majority of water used in making soft drinks comes either from the city water supply or from wells at the brewery, cannery, or bottling facility wells which draw from the same aquifer as all the other wells in the community. City water comes from wells, springs, lakes, reservoirs, or from river water. If pollutants exist in the supply, it goes right into the bottled or canned product. Whatever the source, anything that was in the water which was used in making soft drinks and beer, is still in it when you drink it. These drink manufacturers have added still more chemicals to make their products. Rivers or reservoirs are sometimes contaminated with chemical spills, but a city's water is constantly tested by the engineers of the water department. Rural areas' water supplies are periodically checked by the counties. The counties are checked by the state. The Environmental Protection Agency also monitors the water all over the country to ensure the safety of the water supply. I don't think that the E.P.A. would allow people to drink anything as toxic as the media would lead us to believe. Only water can clean waste products and toxic chemicals out of the body and out of the brain. If a person does not eliminate these waste products, it will cause disease and will alter his behavior in some way, sooner or later. rate of drug abuse has increased. Of course, there are other reasons why these things have occurred. However, I believe the fact that Americans have greatly increased their intake of poisonous chemicals has played a major role in these phenomena. Another example can be found in the fast-growing country of Korea. Until the 1980s, the Korean people were too poor to afford soft drinks. They were forced, financially, to drink water. Also, due to almost no air conditioning and a lack of cars, Koreans generally perspired heavily. During this time, their brains were very 'clean' family bonds were tight, Korean industry was booming, and children were doing well in school. As Korea became richer, more problems developed. Now, in Korea, most people prefer soft drinks, many houses have air conditioning, and cars are becoming more easily accessible. The divorce rate is now climbing. Student protests are more violent than ever before, the crime rate is skyrocketing, and criminals are becoming more vicious. Workers do not wish to work, and employers do not wish to share. Again, the causes of these problems are complicated, but I believe that chemical intake and improper internal cleansing have been major factors. A patient of mine who is an experienced grade school teacher told me that she used to spend her time teaching but now she feels stressed and angry as she has to spend most of her time keeping the students quiet and seated at their desks. She is depressed that she has so little time to teach them their lessons. I believe these bad actions on the part of the students are the result of the chemicals we parents introduce into their fragile brains by allowing children to drink soft drinks and to eat junk food loaded with artificial ingredients. Most Oriental health books recommend that you drink 'living water' but never explain exactly what they mean. If you visit Seoul, Korea, you will see thousands of people awake in the early morning, 5:00 to 6:00 A.M., climbing nearby mountains for 30 to 60 minutes before going about their daily work. They go to the mountains to drink fountain water for better health. Most of them start this practice when they become sick. After doing this daily, many find that their illness begins to disappear and they become healthier. Because they feel good, they continue this morning routine. To me this makes a lot of sense-walking daily for 30 to 60 minutes, breathing fresh mountain air, then drinking clean, uncontaminated, oxygenated fountain water. This is a good practice for anyone searching for better health. Koreans call this uncontaminated fountain water 'living water,' its traditional name. The following are the definitions of living water and dead water: Living water is water which is compatible with life Freshwater fish can live in it. It is the fresh rain water that sprinkles your garden. It is water which may contain some minerals but which certainly contains oxygen. Dead water is water which is not compatible with life. Distilled water and carbonated water are dead waters because fish die in them, even though those waters have no impurities. Plants, also, cannot live on dead water. What causes the contradictory natures of essentially the same water is the amount of oxygen in the water. Water which contains the proper amount of oxygen is not harmful to fish and plants. Water which contains too little oxygen will kill those same fish and plants. When you put fish in water which has been boiled and cooled, the fish will die because boiling has removed the oxygen from the water. If you don't have a bubbling fountain, you can easily cause oxygen to dissolve in water by stirring it in a blender, or by shaking it fill a container about half full of water, put on a tight lid, and shake the container. This will properly saturate the water with oxygen to the right concentration. One of the basic principles of homeopathy is that small quantities of medicines should be succussed; that is, medicines should be diluted and shaken. Homeopathic physicians observed, over the years, that this diluted and shaken medicine works better and they say this 'vitalizes' the drugs. I believe that the importance of shaking is to add beneficial oxygen to the mixture, as well as stirring up the contents. I truly believe that before you drink water, you should shake it. If you do as I have described, your digestion as well as your general health will improve and you will be more resistant to diseases. You must not expect immediate results, but over the years it will benefit you. Many of the chemical processes which take place in the stomach and small intestine run more efficiently if there is enough oxygen present. Therefore, drinking living water also helps digestion. I recommend drinking six to ten eight-ounce cups of water per day for the average person, depending on their weight. You must remember to balance the intake and output of water. Taking in too much water is as dangerous as dehydration. A person can become intoxicated by over-hydration. He will experience nausea, weakness, dizziness, trembling hands, cramping, and eventually would lose consciousness. You should not drink over twelve eight-ounce glasses (about 3000 cc) of water a day, except under special conditions. One important rule of good health is "do not overdo," or "everything in moderation.". Even something known to be good for health can be dangerous if taken in too large quantities. Water, vital to life, can be harmful if consumed in excess. Doctors and researchers know that the main cause of aging is the accumulation of waste products in the body. The human body is composed of 100 trillion living cells. Each individual cell works and lives for you. To do this, each cell takes in nutrients, utilizes those nutrients, and discharges its waste products. 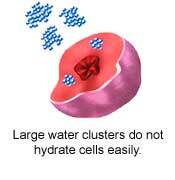 Water then flushes the cells' waste products away. The same is true of your whole body. You eat, digest, and wash away your excretions mainly with the help of water. When you wash your clothes, you fill your washer with water, not soft drinks, coffee, tea, or juice. Water is the only thing that can clean your clothes. The same mechanism applies to cleaning your body's cells. Only proper amounts of water can clean your body's cells. I have encountered many people who take pride in saying, "I never sweat," or "I never drink water." I have observed that these people appear much older after the age of forty than people who sweat and drink water. By the age of fifty, many of them have become afflicted by arthritis or other 'incurable' diseases. Doctors can't completely cure these diseases because they don't yet know the causes. When I meet people who are seventy-five and look twenty years younger, invariably I find that they sweat regularly and drink water. In my opinion drinking plenty of water prevents the buildup of toxic waste in the body, thus expelling the cause of many diseases. Drinking lots of water also slows down the set of symptoms which we generally refer to as aging. The cause of Alzheimer's disease is unknown at present. Researchers are aware that the nerve cells of people affected by this disease contain large amounts of unusual waste chemicals which eventually destroy the nerve cells. Eventually the number of nerve cells in the brain becomes drastically reduced, which causes the diminished abilities of thought and speech. The brain lives in a liquid environment. I believe that, since drinking water minimizes waste accumulation in the brain, it can also help prevent Alzheimer's disease and other brain abnormalities. I wonder how people expect to clean their brain cells without enough water. The environmental liquid with which the brain is surrounded is called spinal fluid. One of the signs of a fractured skull is some of this clear liquid leaking out of the ears. A spinal tap is also used to draw a small amount of this vital fluid in order to test for some brain diseases such as spinal meningitis. I only mention these things here to reinforce how important I believe it is to keep your brain clean by a constant intake of the most vital of thing of all-water. Drinking enough water is an every-day-of-your-life thing. It is the essential ingredient for making all the Chunging exercises work for you. And like the other exercises I recommend, it is never too late to start drinking the proper amount of water; at any age, your body will definitely benefit. 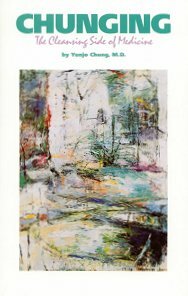 Author: Dr. Chung was educated in Korea, completing his M.D. 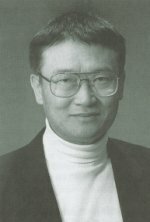 in 1963 from the University of Korea. He came to the United States for further medical training in 1966. He is Board certified in Obstetrics and Gynecology since 1973. By that time, he had fallen in love with America, and he and his wife became citizens of the United States. He wants to contribute to the betterment of his beloved adopted country by teaching people to cleanse away the cause of disease to prevent and cure illness and to keep them functionally fit their whole lives.